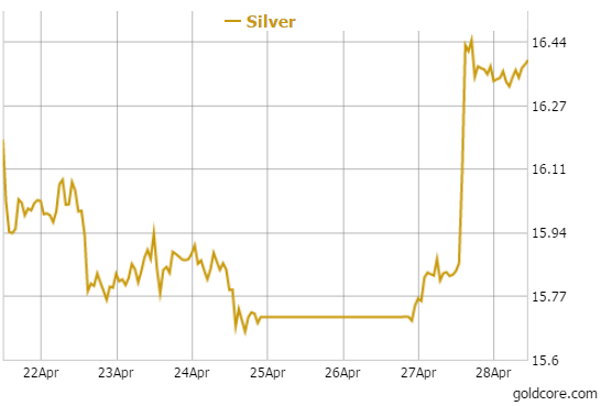 Precious metals had their best day since January yesterday as the price of gold and silver rose substantially. Gold rose over 2% and is now back above the important $1,200 per ounce psychological mark while silver surged 4.4% and is now comfortably above $16 per ounce. Many factors seemed to have come together to generate the rise in prices but the primary cause seemed to be buying in the futures market which led to short covering which quickly propelled gold from $1,180 an ounce to over $1,205 an ounce in a short period of time. Silver prices surged from around $15.80 an ounce to $16.45 an ounce or 4.1% prior to selling which capped prices below the $16.50 level. Physical gold demand in the major Asian markets was positive after last week’s price fall, dealers told Reuters, with Shanghai premiums moving up toward $4 an ounce suggesting a return to more robust demand in the world’s largest buyer China. Risk appetite remains high as seen in buoyant stock markets but some investors may be getting nervous about the near inevitable Greek default - and rightly so. European stocks have seen falls today. The uncertainty regarding the outcome of such an event has been getting more attention in the media in recent days with the general consensus being that nobody has any idea what the knock-on effects might be – but that it would be far from pretty and could be a “Lehman moment” for the EU. Greece must pay $3.8 billion to the IMF over the course of the next month and most analysts believe they will not be in a position to do so unless they can access the outstanding $7.2 billion in funds that form part of the existing program. These funds are being withheld by Greece’s “partners” because the Greek government has not put forward reform proposals that are acceptable to the Troika. The Eurogroup of EU finance ministers have grown exasperated with Greek finance minister Yanis Varoufakis following the failure of the latest round of talks in Riga. Greece has reorganized its debt negotiating team sidelining Yanis Varoufakis after the poor results from last week. He was described by fellow ministers as a “time-waster”, a “gambler” and an “amateur.” Such name calling, so late in the process shows how little progress has been made over months of negotiations and will likely be counter productive as the Greek people rally around their recently elected and appointed Finance Minister. Gold remained strong supported by a weaker dollar and short covering on worries that the Federal Reserve may push out the rate hike and maintain zero percent interest rates due to recent poor economic data. 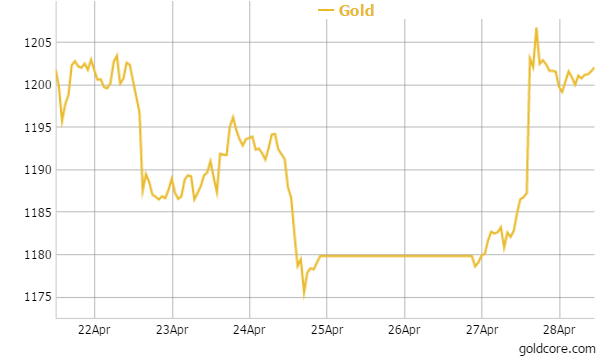 The U.S. dollar fell to a three week low which helped gold. The U.S. FOMC begins its policy meeting today with its statement to be issued on Wednesday. Ukraine have also been flirting with a default. Earlier in the month “Kiev warned investors that it was prepared to allow the state-owned bank to default unless a deal could be agreed” according to The Financial Times. That particular crisis has been resolved but Ukraine is still under severe pressure. There is a $40 billion financing gap, according to the FT and a deal will need to be reached with the IMF by June if Ukraine is to get funding. But credit agencies do not have a lot of faith in Ukraine and have “cut the country’s rating to one level above default” according to the FT.
Skirmishes continue in the East of the country and if they were to escalate again it might preclude Ukraine from IMF funding. The IMF is not allowed to finance a country that is at war. Tensions between the U.S. and NATO on one side and Russia on the other remain very high. The Ukrainian military and pro-Russian separatists in eastern Ukraine have traded accusations, reviving concerns that a peace deal signed in Minsk in February may collapse. Although international monitors said the violations were still relatively limited. A senior U.S. official has strongly criticised Russia for allegedly threatening to use nuclear weapons. In an interview with Japan’s Kyodo News, Rose Gottemoeller, the under secretary of state for arms control and international security, criticized Russian President Vladimir Putin for threatening to use nuclear weapons. Vladimir Putin recently signed and enacted a new Russian military doctrine which proposes that Russian nuclear weapons defense systems near the EU be expanded. Importantly, this is being done through joint defense projects with China, India, and other countries. This suggests that Russia is not as isolated as some claim. Respected former Soviet leader Mikhail Gorbachev has warned that the Ukraine crisis may transform into World War III and has warned that a nuclear war between Russia and the U.S. is possible. In this context, the very large Russian central bank gold purchase of 31 metric tonnes in March should be seen as a geopolitical gambit and another volley in the ongoing currency wars. The IMF figures show that Russia was the largest central bank gold buyer in the month. The next phase of currency wars is likely to be gold wars where nations use gold reserves as a monetary and geopolitical tool and weapon in order to gain economic and strategic advantage. The continuing accumulation of gold reserves by nations for diversification, monetary and geo-political purposes – especially Russia and China may accelerate in the coming months leading to a lack of available liquid bullion in large formats which then spreads and leads to shortages into the smaller coin and bar market. The old adage that he who holds the gold makes the rules will be better understood when there is a lack of available supply due to the very small size of the physical supply of gold above ground and refined globally. Today’s AM LBMA Gold Price was USD 1,201.40, EUR 1,100.56 and GBP 788.17 per ounce. Yesterday’s AM LBMA Gold Price was USD 1,182.75, EUR 1,090.52 and GBP 780.85 per ounce. Gold climbed 2.02 percent or $23.80 and closed at $1,202.40 an ounce yesterday, while silver soared 4.2 percent or $0.66 closing at $16.38 an ounce. Spot gold in Singapore was at $1,200.90 an ounce near the end of day trading. In late morning trading in Europe gold for immediate delivery was up 0.21 percent at $1,203.14 an ounce. Silver was up 0.22 percent at $16.38 an ounce, while platinum fell 0.05 percent to $1,141.09 an ounce. Disclaimer: The information in this document has been obtained from sources, which we believe to be reliable. We cannot guarantee its accuracy or completeness. It does not constitute a solicitation for the purchase or sale of any investment. Any person acting on the information contained in this document does so at their own risk. Recommendations in this document may not be suitable for all investors. Individual circumstances should be considered before a decision to invest is taken. Investors should note the following: Past experience is not necessarily a guide to future performance. The value of investments may fall or rise against investors' interests. Income levels from investments may fluctuate. Changes in exchange rates may have an adverse effect on the value of, or income from, investments denominated in foreign currencies. GoldCore Limited, trading as GoldCore is a Multi-Agency Intermediary regulated by the Irish Financial Regulator.